This tutorial is not how to make a real life ballet dancer pancake tutu like these. Pancake ballet tutus use much more tulle, often need a support underneath, take a looooong time to build, and cost a ton of money. 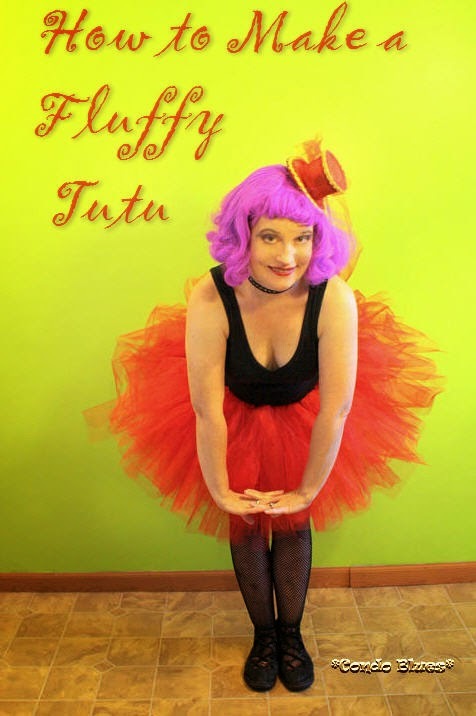 If you need a quick and cheap tutu for Halloween, a short performance, cosplay, Steampunk, running costume, or for just for dressup fun, then this tutu tutorial is for you! 1. Fold the tulle in half width wise and and cut the tulle into strips that are 7 inches long. Keep measuring and cutting until you have cut all of the tulle. After I cut all of my tulle, I cut the strips in half to make my tutu shorter since I’m so short. 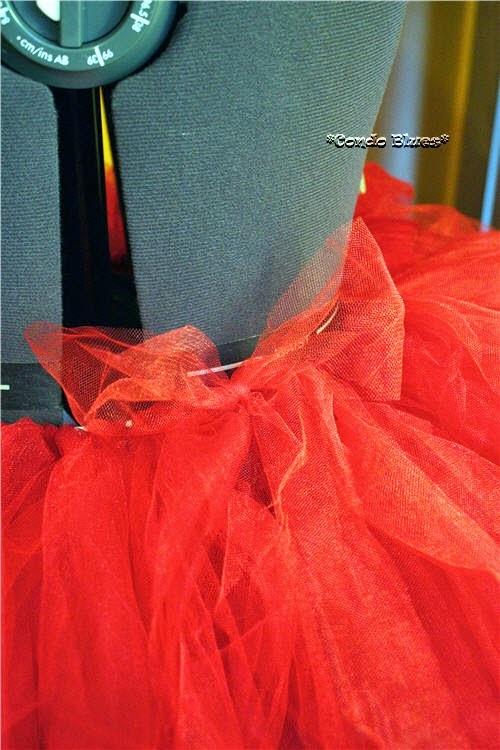 If you want a longer tutu, you can leave the tulle strips as you originally cut them. 2. Measure your waist and cut a piece of elastic to its size. 3. Put the elastic around your work surface and safety pins the ends of the elastic to each other to make a loop. 4. Fold one strip of tulle in half, slip it under the elastic, pull the loose ends around the elastic, and through tulle loop. 5. Pull the tulle tight to make a slip knot. Warning: Your elastic may start to stretch out as you pull the knotted tulle tight. That’s OK, keep going. We will fix that in Step 8. 6. Repeat Steps 4 and 5 forever and ever until you have knotted all the strips of tulle along the elastic band. Play some jams or watch a movie while you work, if you like. I alternated a strip of each shade of red tulle along my elastic band. By the time I finished the tutu it was so fluffy the shading looked random, which is what I wanted. 7. Remove the tutu from your work area. 8. Try the tutu on. If the elastic has stretched (and chances are it will) remove the safety pin and repin the elastic so it fits your waist. Trim the leftover elastic with scissors. After I trimmed the elastic to fit my waist again, I sewed the elastic closed with a few hand stitches. I didn’t want the pin to accidentally come undone during a performance! 8. Optional: Sew the elastic waistband closed with the needle and thread. 9. Optional #2: You can tie a piece of ribbon into a bow to hide the spot where the elastic meets. I used a leftover piece of tulle. It also reminds you which side of your tutu is back! 10. Fluff the tulle and flutter off to your party! Dancers tip: Wear a pair of flesh colored tights (or pantyhose if you wearing them as part of a Halloween costume) under your fishnet tights. Don't buy the cheapo fishnet tights at the Halloween store buy professional dancer's fishnet tights with the solid foot. The flesh colored hose will even out the skin tone of your legs ando helps the slippery fish net stockings stay putand from bagging around your ankles with movement. Dancer's tights have a flat nylon sole so you aren't painfully walking on little ropes all night. Do you like my tiny top hat? Click here to learn how to make a mini top hat fascinator. You won’t believe what I used to make it. So easy!